Landscape Advice Center ™ - Earth Advisors, Inc. 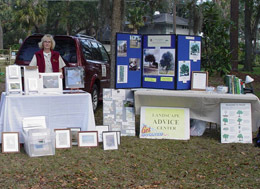 The Landscape Advice Center™ is a service to provide landscape, urban forestry and environmental advice to the public or attendees at a seminar or conference. Earth Advisors consultants will bring display items, handouts and information to share at the Center. We concentrate on helping people achieve lower maintenance and sustainable landscapes. Demonstrations and examples of residential landscapes, community enhancements, and commercial landscapes improved to be sustainable landscapes can also be shared. The Landscape Advice Center can be provided as a paid service or as a free educational service as part of Earth Advisors' community services program. 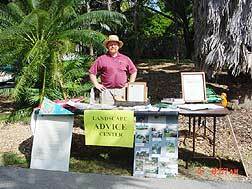 Call us to bring the Landscape Advice Center to your event, program or conference. Landscape Advice Center for public events.